Thanks to everyone who played along in the MyRaceRagz.com givewaway! 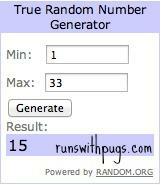 I ran the number of entrants through random.org and came up with lucky number 15. Megan, guess what? Now you know all about myraceragz.com and can design a shirt all your own! Send me an email and I’ll get you all set up! 5 Responses to myraceragz.com giveaway winner! May I suggest something funny the rest of the runners will love you for giving them a chuckle. OMG!!!! I’m so excited!!!!!! Help me come up with a clever idea!! I’ve done some dumb things that have caused some of that not so fun chaffing too! I have a runner belt I use to carry items, but honestly after looking at your hipsister, I think I am going to look into getting one of those, it looks much less bulky than mine, and I like that it looks like it will stay where it is put. I am so glad you shared this, thanks!!! I hope you love it if you decide to try it out. I’m happy to share when I find something that I really like!